His winnowing fan (shovel, fork) is in His hand, and He will thoroughly clear out and clean His threshing floor and gather and store His wheat in His barn, but the chaff He will burn up with fire that cannot be put out. Matthew 3:13 The Amplified Bible. John spoke this parable to foretell actions of the coming Messiah (Christ). John preached personal acknowledgement and repentance of sins followed by baptism—full body emersion—in water as an outward sign of repentance. The water of baptism washed sins away. John didn’t stop with his message of repentance and physical act of baptism. John exhorted those baptized to change their behavior and bear fruit consistence with repentance (Luke 3:8-14). When the baptized asked him what they should do, John’s answer wasn’t that they quit their jobs; rather in their lives and jobs, they should act honorably, treat others fairly, and share with the less fortunate. For example, John told men with two tunics to give one to the man who had none. Soldiers should stop accusing people falsely and extorting money from them. John the Baptist spoke bluntly to the multitudes that came to him for baptism; but reserved his worst denunciations for the Jerusalem’s elite, i.e., Pharisees, Sadducees, and priests. He called them vipers (Luke 3:7). The fierceness of his words, suggests firsthand knowledge of their behavior. Perhaps, when he rotated through the Jerusalem temple as a priest, John saw the excesses, insincerity, and, yes, even corruption that infected the leaders of the Herodian-style Jerusalem temple. In ancient Judea, wheat kernels (seed, grain) were separated from the chaff (stalks, straw) on threshing floors. Generally, chaff was unusable except as fodder for livestock. The farmer separated the wheat kernels from the chaff using a process called winnowing. Winnowing consisted of throwing the threshed material (chaff and grain) into the air with a fork or a winnowing basket. The wind separated the valuable grains of wheat from the chaff. Because wheat kernels were heavier than chaff, they fell to the ground. The lighter chaff, dirt, etc., were blown away by the wind. At times, farmers used fans to create air currents to blow chaff and other impurities away from the valuable wheat kernels. When John the Baptists told the parable of winnowing wheat and chaff, the spiritual reality was that the coming Messiah (Christ) would distinguish or separate the righteous from the unrighteous. Christ would critically analyze peoples’ hearts, not pious actions that were outward displays for show. John said that sincere, righteous individuals – the wheat kernels—would be taken and stored in the farmer’s barn, i.e., heaven. In contrast, the chaff, those with pretend piety, will be forever burned. Reflection: God is not going to accept any dirt, chaff or straw into his barn. Where does that leave you and me? Check out http://www.CarolynRothMinistry.com books on plants. Copyright August 11, 2016; all rights reserved. Suggested readings Exodus 25:23-30; Leviticus 2; Leviticus 24:5 – 9. Fine wheat flour was used to make the loaves of bread that was placed on the Table of Presence in the Holy of Holies in the Tent of Meeting. In the Bible, the loaves are called the bread of the Presence, the Presence bread, or the Showbread. (Exodus 25:30). There was one loaf for each of the 12 tribes of Israel. The loaves represented a perpetual bread offering to God.The Presence-bread was set out in two piles of six loaves (Exodus 24: 5 – 9). Each pile was set on a solid gold plate used exclusively on the Table of the Presence. Every Sabbath a new set of 12 loaves was set out before the Lord as an everlasting covenant. The loaves that were removed from the Table belonged to Aaron and his sons who were directed to eat them in a holy place. Most likely the holy eating place was the courtyard outside the Tent of Meeting (Exodus 6:16). On the Table beside the stacks of Presence-bread, pure incense was set out. The incense was burned to represent the bread, an offering made to the Lord by fire. No part of the Presence-bread itself was ever burned. In Old Testament times most wheat was milled into flour to make bread. Milling was a mechanical process of separating the wheat endosperm from the bran and germ. Then the wheat endosperm (starch) was ground into flour. The bread of the Presence was made with “fine flour” (Leviticus 24:5; NIV Study Bible note Exodus 2:1) which means no wheat bran or germ remained in the flour and the flour was thoroughly ground. In most early societies, men planted and harvested wheat while women milled and baked the resulting flour into bread; however, the Kohathites (the second of Levi’ sons) were charged with baking the Presence-bread. When the Bible described the Presence-bread, it was not identified as made without yeast (unleavened). Yet, more than likely it was unleavened because all grain offerings baked in the oven and presented in the Tabernacle were required to be made without yeast (Leviticus 2:4, 11). There are three possible sources for the wheat used to make the fine flour for the Presence-bread. First, possibly the flour came with the Israelites out of Egypt. Yet if flour was available, why did the Israelites grumble against Moses and Aaron in the Desert of Sin, complaining that they had no food (Exodus 16: 1-16)? It was in the Desert of Sin, about 2 ½ months after the Israelites left Egypt, where God began to feed the Israelites with manna. God provided manna which could be baked into a type of bread the entire 40 years the children of Israel wandered in the Sinai Peninsula. A second source of the fine wheat flour used to make the Presence-bread could have been wild wheat. When the Tabernacle was built, the Israelites were camped at Mt. Sinai, now known as Mt. Safsafa at Wadi Raha. Mt. Safsafa is part of St. Katherine’s Municipality, South Sinai, Egypt. This area is high altitude desert (5,200 feet) and winter nights can drop to below 32 degrees Fahrenheit. The St. Katherine’s area is the only place in Egypt where snow falls on a regular basis. The mountain snow melts slowly, releasing water at a steady pace, replenishing underground catchment areas. When rain falls, water flows rapidly down the barren Sinai Mountains and drenches the valleys, gullies, and wadi at the base of the mountains. Residents of St. Katherine’s Municipality reported that in older times there was at least one rainfall every 40 days and valleys were greener than present. Wild wheat and even domesticated wheat could have possibly grown in the area of Mt. Sinai. In the Mid-East wheat is planted in the fall (about November) and harvested the spring (April) . Perhaps the Israelites found wild wheat or planted winter wheat around the base of Mt. Sinai where they camped for 11 months. This wheat would not have been sufficient to feed the approximate two million Israelites, but it may have been ample to make fine flour for the Presence-bread. Further, the Israelites could have found wild wheat in various places during their 40 year journey over the Sinai Peninsula. An argument against finding wild wheat on the Sinai Peninsula is in Numbers 20:5 where the Children of Israel complained to Moses that the Peninsula has “no grain or figs, grapevines or pomegranates.” By this time the Israelites had wandered around the Sinai Peninsula almost 40 years and they were very aware of its plant life. A third possible source of fine wheat flour could have been from traders. As early as the 16th century B.C. the Sinai Peninsula was an important cross-road for traders. In the 16th century B.C., the Pharaohs built the way of Shur across the Sinai to Beersheba and into Jerusalem. Other trade routes crossed near the center of the Sinai, connecting Egypt and the Arabian Peninsula. It is possible that fine wheat grain or flour from the Nile Delta was transported along trade routes. Egypt was known to export grain (Genesis 24:3 – 5). Certainly, the Israelites had sufficient gold and silver to purchase raw grain and/or fine flour from traders (Exodus 36: 3-7). Research shows that cereal gatherings could have occurred as early as 17,000 B.C. in the near east. 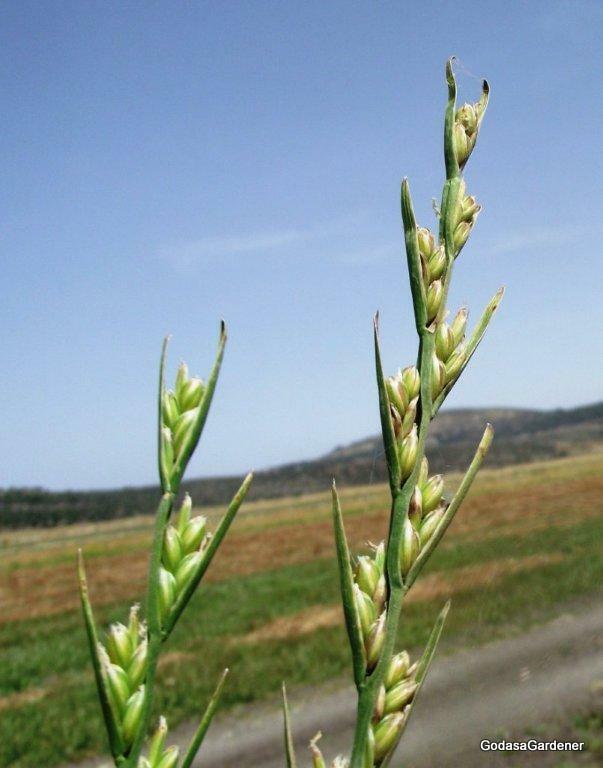 The earliest wild wheats were einkorn (Triticum boeoticum) and emmer (T. dicoccidoides) which grew in southeastern Turkey and northern Syria. Archeology records documented that wheat was domesticated prior to 7000 B.C. and grown for harvest in the Fertile Crescent and in the Nile delta region (northern Egypt). 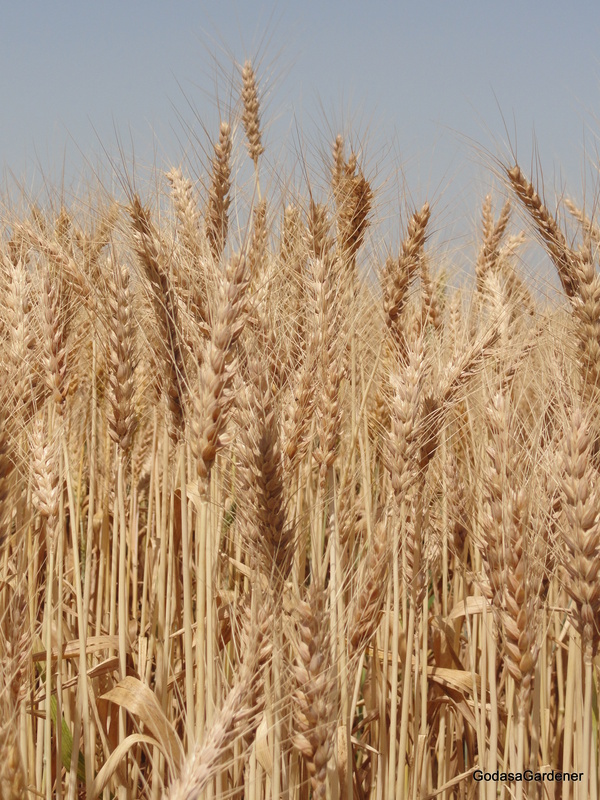 In the Bible wheat is first mentioned as harvested by Jacob in Palestine (Genesis 30: 14). Wheat is an annual crop that grows best in temperate climates. Wheat grows in about 100 days in a frost-free growing season. To obtain a good wheat crop, from 15 – 20 inches of precipitation are necessary. In areas of no more than 10 – 15 inches of precipitation, wheat is often planted every 2 years. The land is kept free of vegetation on the alternate year so moisture can accumulate in the soil. Wheat kernels consist of three parts. The outer covering (about 12%) is called bran. The center (endosperm, 85%) is composed of starch, the portion present in white flour. The inner part of the kernel (2 – 3%), called the germ (embryo) expands, or germinates, into the new wheat plant. Wheat has been valuable to man from time immemorial and it was valuable to God who commanded that the Israelites make the Presence-bread from it. I am intrigued that God told the Israelites to bake bread weekly out of wheat, a grain that was not in large supply on the dry Sinai Peninsula. Why didn’t God allow them bake manna for the Presence-bread? Manna was plentiful and God provided a steady supply of it. Instead God required the Israelites to make an offering from wheat, a grain they had to seek during their 40 years of travels. If I want a light burden today — here in this world — I must come to Christ and learn from His life. When I study the life of Christ, I see a man who seemed to be without ego. Christ didn’t have to have His own way all of the time. He lived in the presence of his Father and did God’s will, even dying because it was God’s will. Christ described himself as gentle and humble. Gentle and humble isn’t an easy way to live. It seems counter-intuitive to many women my age who worked hard to achieve in a world geared to men. But, I’m not willing to say that Christ’s directions on how to live are wrong. And, I am reminded of St. Paul’s words, “I urge you, in view of God’s mercy, to offer your bodies as living sacrifices, holy and pleasing to God – this is your spiritual act of worship. Do not conform any longer to the pattern of this world, but be transformed by the renewing of your mind” (Romans 12:1 – 2). Reflection. I think I understand it now: To have a light, unburden life, I need to be gentle and meek as Christ was. A life such as this does not conform to the world. It is a living sacrifice – a sweet perfume – offered daily to Christ. In this new paradigm, my life becomes an offering to God much as the fine wheat Presence-bread was an offering and sacrifice to God. Copyright January 25, 2011, Carolyn A. Roth; all rights reserved.